Saturday, the walking tour at Mountain View Cemetery focused on Black History Month. This tour covered spots around entire cemetery, which is quite large, so we carpooled rather than walked for most of it. Our docents were Gaye Lenahan and Sarah Calhoun, who are both very knowledgeable about the cemetery and its occupants. 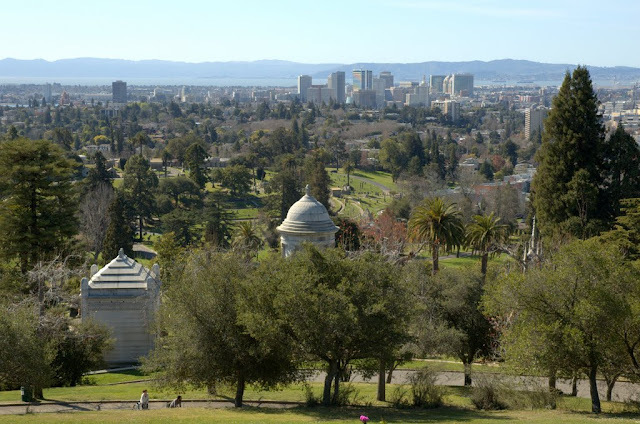 First we heard about Frederick Law Olmstead who designed Mountain View Cemetery. He's best known as a landscape architect, but was also a journalist. He was hired by what is now the New York Times to research the slave economy. After touring Texas, Olmstead realized that not only was slavery morally wrong, but he believed it was expensive and economically inefficient. His subsequent writings helped inform and galvanize antislavery sentiment in the north. The first grave we visited was one I visited recently, the grave of Captain William Shorey, the 'Black Ahab'. He was the first black captain operating on the west coast back in the 1880s. He died during the Spanish flu pandemic in 1919, and is buried with his wife Julia Ann (1944) and daughter Zenobia Pearl (1909). Then we went to an unmarked grave for Isaac and Elizabeth Flood. Isaac was born into slavery in South Carolina, but somehow made his way to California. Elizabeth Thorn was born a free woman in 1828 and educated in Massachusetts. 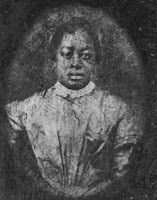 When her son by her late first husband, Joseph Scott, was not allowed into a school in Sacramento, she opened a private school for black children. Elizabeth and Isaac married in 1855 and moved to Brooklyn, just outside of Oakland (the neighborhood near Highland Hospital is also known as Lynn), where she started another school in their home on East 15th. Elizabeth and Isaac went on to help found the First African Methodist Episcopal church, which eventually took over the school. 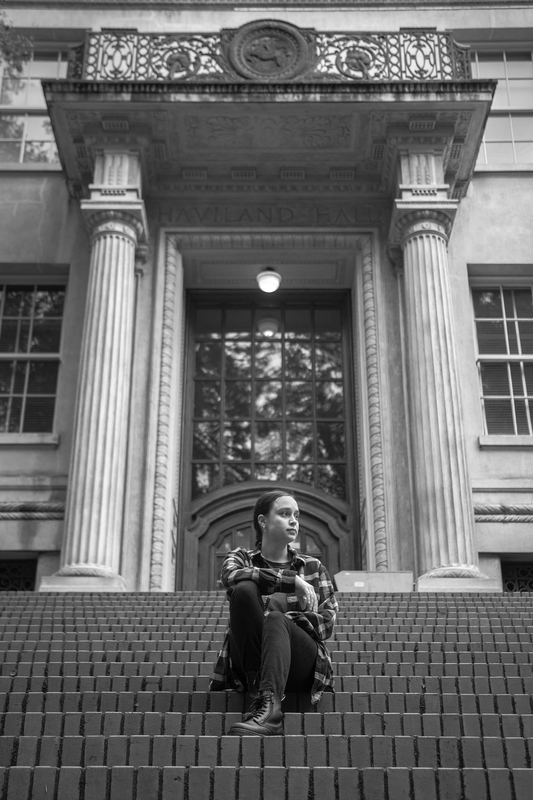 Isaac helped challenge segregation laws, and their daughter, Lydia Flood, became the first black student to attend John Swett School in Oakland in 1872. Lydia went on to become active in the movement for women's voting rights. The plot is unmarked, but a docent discovered it when she noticed the name Isaac Flood on an old plot map of the cemetery and did some investigation. Nearby, on what is now a plot with mostly Elks Club members buried there, is another unmarked grave. This one is the final resting place of Jenny Prentiss and her children. You may remember her from the New Era, New Politics walking tour downtown—she was a former slave who was Jack London's foster mother. 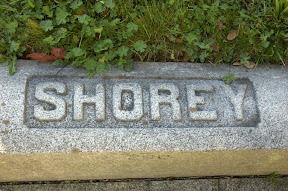 Her husband Alonzo is buried separately in the veterans plot, but he knew Captain Shorey and played cribbage with him. Our next stop was a long way up the hill. Unfortunately one of the docents fell ill during the drive, and we spent some time figuring things out, then shuffling amongst cars while another docent who was along took Gaye to get checked out. 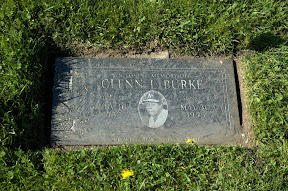 We eventually found the next marker, the grave for major league baseball player Glenn Burke. He was the first and only openly gay player in baseball, and suffered discrimination both for his homosexuality and his race. When he was with the LA Dodgers, he drew the wrath of manager Tommy Lasorda for befriending his estranged gay son, Tommy Lasorda, Jr. But he's also known for having invented the 'high five' with then teammate Dusty Baker. Burke had a rough time after a shortened baseball career, but his former teammates and the Oakland A's came to his assistance when they found out he was suffering from AIDS. 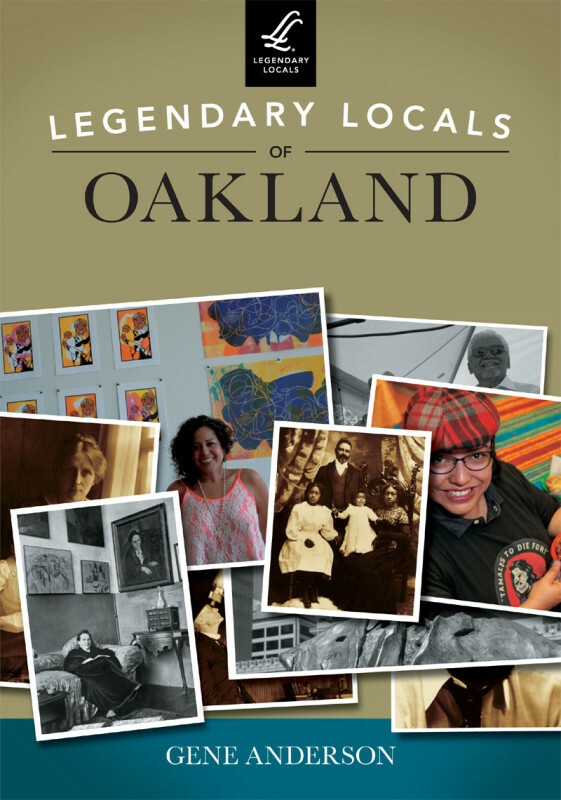 Glenn Burke died in 1995 at Fairmont Hospital in San Leandro. His mother Alice died in 1999 and is buried nearby. The next scheduled stop was for the grave of Byron Rumford, another name you may remember from the New Era, New Politics walking tour. He was the first black elected to public office in Northern California, and has a section of highway 24 named after him. Unfortunately the remaining docent didn't know the exact location of the grave, so I didn't find it until later. William Byron Rumford died in 1986, and his wife, Elsie Rebecca Rumford died in 2002. 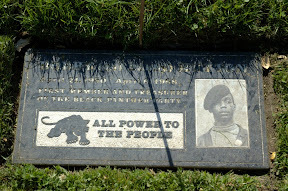 The grave we did find next was for Lil' Bobby Hutton, the first to join the Black Panthers. He was born in Arkansas, but his family moved to Oakland when he was three years old, after nightriders began intimidating blacks in the area. At age 16, he was the first member to join and the first treasurer of the Black Panther Party. He died April 6, 1968, when he and other Black Panthers were surrounded in a house in West Oakland. Eldridge Cleaver said Bobby stripped to his underwear to show he was unarmed, but police shot him more than dozen times. 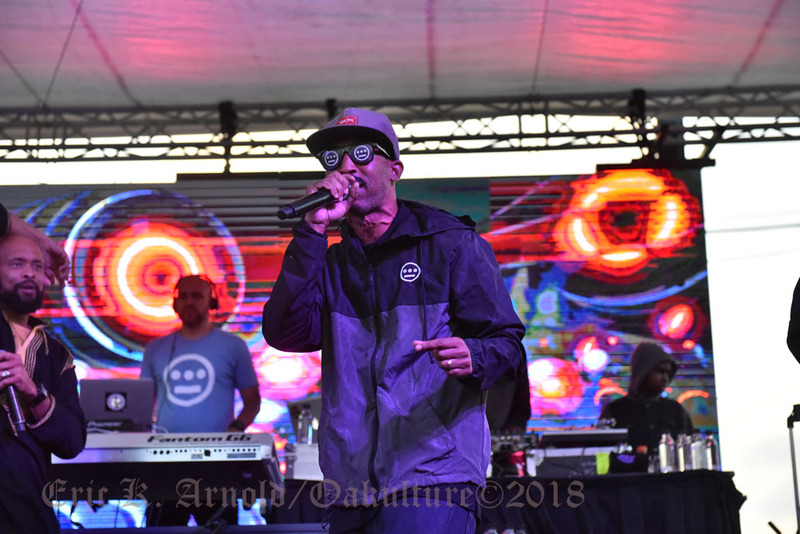 Police maintained that Hutton attempted to run away and ignored orders to stop, but one Oakland police officer who witnessed the shootout later told Cleaver that, "What they did was first degree murder." Bobby Hutton was buried in Mountain View Cemetery, but didn't get a gravestone until 2003, 35 years after his death. 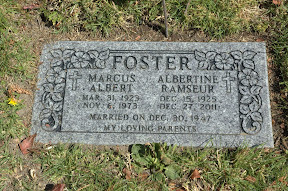 Then it was back around the hill to the grave of Marcus Foster, who was the first black superintendent of the Oakland Unified School District. He was murdered by the Symbionese Liberation Army (SLA; of Patty Hearst fame) because they believed he supported student ID cards and police in schools. He and his deputy, Robert Blackburn were shot by SLA gunmen with bullets dipped in cyanide, but Blackburn survived. His wife Albertine (Abbe) died recently on December 27, 2011, and is buried alongside him. We went past the Grand Army of the Republic plot which I visited a couple of weeks ago, and saw the grave of Obediah Summers. He was born into slavery, and his master paid for him to take his place in the Confederate army. Obediah was captured, and then enlisted in the Union army. He later became a minister, and served as the California State Legislature as its first black chaplain. He wasn't originally buried in the GAR plot, but Obediah's granddaughter Myrna Adams petitioned to have his remains moved. 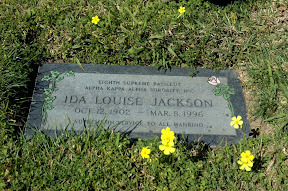 Nearby is the grave of Ida Louise Jackson. She graduated from UC Berkeley in 1922, and was the first black teacher in Oakland (the only one until 1934). Ida was also active in public health, working on the Mississippi Health Project which brought medical care to rural Mississippi. As international president of her sorority (the 8th supreme basileus reference on her marker), she also started a program to train rural teachers during the Great Depression in 1934. Ida Jackson died in 1996 at the age of 93. Our last stop was an unmarked grave in the veterans plot, for Alonzo Prentiss, the husband of Jenny Prentiss. It was a long, but very interesting tour—highly recommended. Well, what a tour that was. I went through your Picasa album and appreciated seeing the folks who took the tour with you. The word 'docent' is not in general use here in Australia. We say either tour-guide or volunteer. Cultural differences are fascinating. From your first image here, I can now well understand why this cemetery is called 'Mountain View'. The reference to the sorority is something that always flies right over my head, although I am well aware that it rates highly in American eyes. We do not have anything like that here in our university system. It seems to be a rather exclusive thing to promote, whereas here we bend over backwards to be inclusive. Thank you for this post and summary, Gene. I really value when someone of your calibre goes to the effort to do both images and text, rather than take the official version from the brochure. What an amazing post. So interesting. Thanks for sharing. Present day sororities and fraternities are different, at least in what makes the news, but 'back in the day' they were service-oriented organizations. Really interesting post this week, Gene. I really need to take these tours instead of randomly wandering around going, "Oh, look at that." Both are fun :-) I think the docents figured out a lot of what they know by wandering around, finding something interesting, then figuring out what they could about the person/people. WHAT a place eh? its chock full of history!! Its a shame that many of the history makers have no stone to mark their spot...It would be awesome to raise money to put up a stone for them..Be a good project for a Scout Troop!! 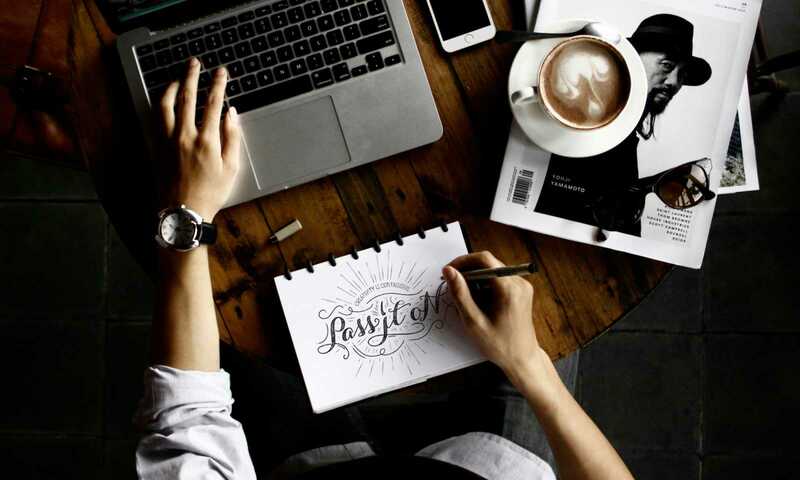 Very interesting post both words and images! It highlights many cultural differences between our two countries, as Julie has mentioned also.